Sometimes God seems far away because you can’t see or feel Him. But He is right there, ready to listen to you. Read along as Jared asks questions about how God hears our prayers and wonders about the answers. In the I WONDER books, Jared uses his imagination as he explores God’s amazing world and flawless character. Children of all ages will love Mona’s whimsical and engaging text and Chris Sharp’s creative color illustrations. 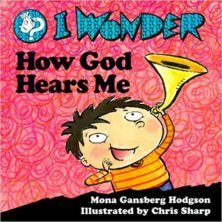 I Wonder How God Hears Me is especially designed for children ages 4 to 8.